It is well known that the labor market opportunities for former convicts are much more bleak than for non-convicts, and it is also well known that young black men are disproportionally represented among the population of convicts, among other reasons because our criminal justice system often unfairly punishes blacks and men. Assistant Law Professor Sonja Starr from the University of Michigan, for example, found that in federal court cases that, among comparable offenders, female arrestees were, “significantly likelier to avoid charges and convictions entirely, and twice as likely to avoid incarceration if convicted.” She also found that men received 60% longer prison sentences than comparable women, with black men receiving the harshest treatments. With these realities in mind, many progressive minded individuals and states have advocated and adopted government regulations which ban employers from doing a criminal background check on job applicants. The theory being that this regulation would protect minority job applicants with criminal histories. However, as Nobel Laureate Milton Friedman was fond of observing, good intentions don’t equal good results, and the results of these “ban the box” regulations have been nothing short of disastrous. In recent research, Sonja Starr (University of Michigan) and Amanda Agan (Princeton) found that when employers were banned from conducting criminal background checks, they simply started hiring less minorities to decrease their chances of hiring a convict. Also, in late 2016, the National Bureau of Economic Research (NBER) released a study examining how BTB regulations affected the employment rates of minorities. 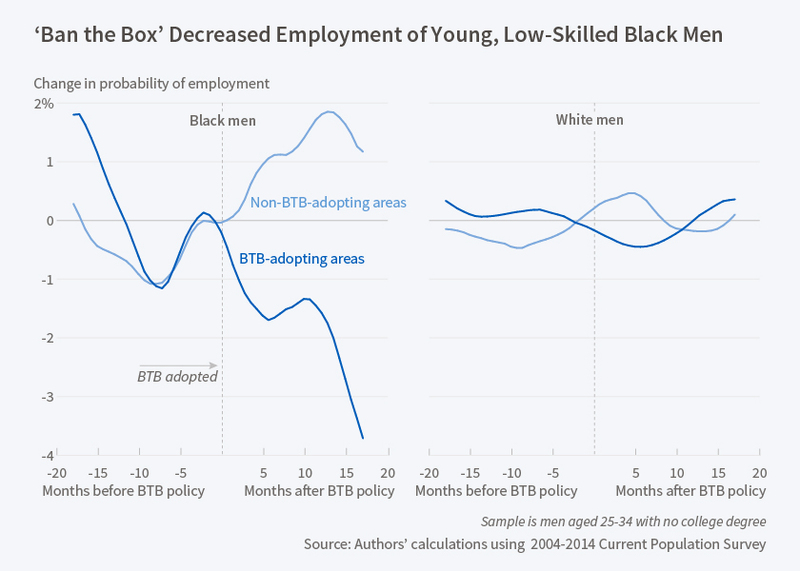 The compared the employment rates of white and black men in BTB adopting and non-BTB adopting areas before and after the regulations were adopted. “Policymakers cannot simply wish away employers’ concerns about hiring those with criminal records,” the authors correctly note. Unfortunately, many people, particularly, progressives, often seem to assume that government intervention is almost always a good thing, when in fact, it often produces more harm than good. I remember from an economic conference some time ago ,20 years? There was no differences in arrests between whites and negroes however there was in gaoling. This was put down to whites being able to afford a decent lawyer. Could be different now however. In so far as employing convicts just an average interview process would tel lyou whether they were suitable or not. ‘manufactured history is usually easy to detect.